One of the best dinners I've ever had! Delicious ingredients, original recipes and perfect quantities. The Chef was also discreet but gave us some insights on his cuisine. I would definitely recommend Francesco! Superb food! A Michelin star experience in my dining room! 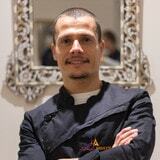 We had a wonderful evening with Francesco who was attentive to every detail. The menu was perfect and tasted and looked amazing. Francesco really makes an effort to be involved in the evening as well as just being the chef, which created a great atmosphere and all guests were incredibly impressed. Exceptional meals which looked as amazing as they tasted. Francesco is such a humble and excellent chef! This was one of the best dinners I have ever had. The food was simply incredible. Everything was prepared to perfection, the taste was unbelievable and the quantities just right. And Francesco is a truly nice guy, which made it very pleasant to have him around! The chef has really impressed us with a very creative and rich cuisine, based on very simple, but good quality ingredients. Nothing too sophisticated, but the whole mix triggered our taste buds and made us ask for more! He also made sure to keep the plates warm while serving all guests. My star-dish is the one that won the competition of "Intinerari del gusto" event in Sardegna: cuttlefish gnocchi with celery raps cream, sea urchin, squid ink powder, candied tomatoes with orange, flavored oil with chlorophyll and parsley. Undoubtedly I prefer cooking with seasonal ingredients because they are more flavoursome... I often work with fresh fish from the sea of Sardegna, and herbs and vegetable - always fresh and in season! Cooking is one of the most rewarding activities on earth... It is my art ! I strive to offer a bespoke dining experience to my clients. If you believe this content violates or infringes your rights, Francesco Pais may not know. You could solve this problem by contacting him.